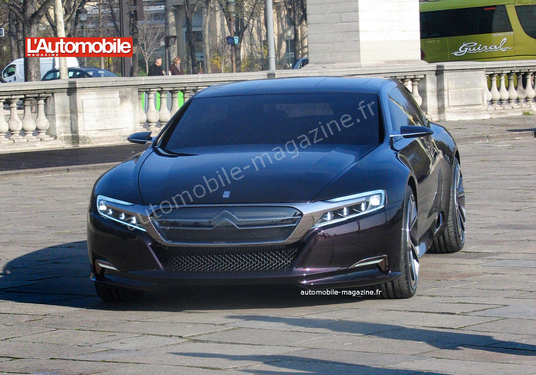 CarConvos: Citroen DS9 Spotted Naked! With all these teasers and leaks in such a short period of time did anyone actually expect the Citroen DS9 would wait for its official unveiling before it ended its three day long striptease? Journalists from the French magazine L’Automobile have managed to capture the first fully unveiled images of the new halo car at a photo-shoot. 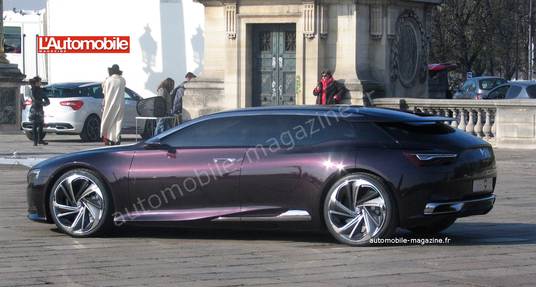 The DS9 looks very muscular, it’s beautiful, quirky and Unique in its concept form, representing Citroen’s lineup in a very good way. The Car has sort of a sedan body with a hatch roofline, if that makes sense, I really like how the whole body is sculpted, giving it sort of a windswept look that suggests constant motion. it definitely has a strong presence from its heavily Chromed front end which reminds me just a little bit of the Acura NSX, to its shapely rear that evokes the rest of the DS lineup, especially the DS5. I’m not normally a fan of purple, except on the Pontiac Firebird, but it looks pretty good on this car. The Journalists present claim the DS9 fills a similar footprint to that of the Metropolis, this is kind of surprising, but I was guessing around 12-14 feet long, so I wasn’t that far off.